I've got a blog post coming up on Monday about my last weekend experience as guest and photographer for Fanboy Expo in Knoxville. Since it's a very detailed post aimed at photo lighting nerds, it's taking a little longer to put together than expected. So I'm throwing up this post for the comic art nerds. 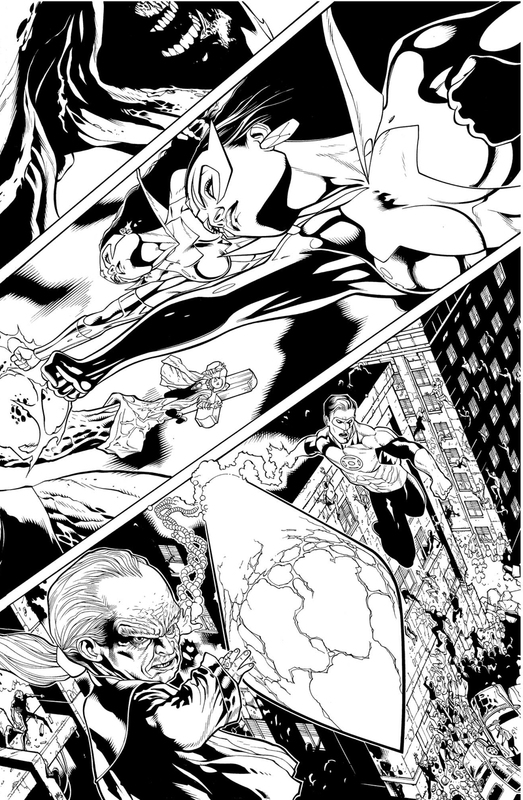 Green Lantern #50, pages 16-17. As usual, this was done during stressful deadline times. Probably took a couple cat naps during this period. People sometimes ask if double-pagers (or splash pages) take longer because they're more "epic" than your average pedestrian page with multiple panels. More often than not, they tend to be easier and can take less time compared to inking 2 average pages combined. I think this is because things on a splash/double-pager tend to be drawn bigger and take up more space. What really slows me down are drawing/inking really tiny things (like a crowd in the background), and since smaller panels tend to lean towards inking smaller, there is more tediousness (is that a word? ).